I’ve been curious about making coconut butter for a while, and I finally gave it a shot. It’s made from dehydrated whole coconut, not to be confused with coconut oil, which has been separated from the coconut’s fiber/protein. I used an 8 oz bag of shredded coconut, minus a few tablespoons that I previously tried putting in a smoothie. (I was disappointed with the smoothie because the coconut was a bit grainy; I’m curious if smoothies made with the coconut butter will be less grainy.) I used this Lets Do Organic brand, though I bought it locally–I paid a bit more per weight, but I’m not ready to commit to 6 pounds of it yet. 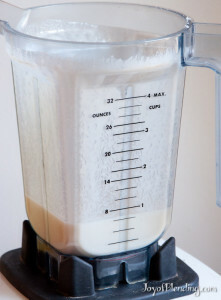 I was slightly concerned that 8 oz wouldn’t be enough to circulate well in the Vitamix, but it turned out to work fine. If you’re an avid coconut butter consumer, you could consider doubling or tripling this recipe, but for now I’m just testing the waters. It was a bit grainy, so I blended it for another minute, though it didn’t seem to make much difference. I guess the fiber just prevents it from being completely smooth. At this point it was totally liquid, so it was very easy to pour out into a container for storage. Some people suggest storing it at room temperature so that it stays soft, but I’m going to keep it in the fridge to be on the safe side. I plan to scoop it out with a hot knife or spoon as I need it (It gets very hard in the fridge). It’s pretty tasty, though I’m not blown away by it. I’ll post an update if I find something good to do with it. Update: A virgin piña colada using this was pretty good. And one note on storing the coconut butter: If I make it again I might pour it into something like an ice cube tray so that it forms into single tablespoon chunks–storing it in the fridge made it quite hard, and it takes a lot of scraping to get it out of my single container. The idea of the hot spoon/knife did not work so well. Update II: Another use: coconut lime rice. After cooking rice, mix in some coconut butter and lime juice. It tastes really good! On a different note, I’ve found that for general smoothies just adding shredded coconut works pretty well. The coconut butter might be marginally smoother, but the difference is minimal, and if you have a smoothie with fibrous things that have a little texture (such as kale), the difference in coconut texture is even less noticeable. If you want something maximally smooth I think you’re better off using coconut milk that’s had the fiber removed (you can make it yourself by blending coconut with water and then straining it). Don’t store coconut oil or butter in the fridge. It makes way too hard to work with. Coconut butters and oils have a very long shelf life. The butter should be good in the pantry for over a year. A good quality unrefined coconut oil can last several years in the pantry. OK, now I know for a fact there’s something wrong with my refurb 7500 that I bought from the factory a couple of months ago. I tried making this a couple of weeks ago, and your hummus recipe tonight, and the blades simply don’t spin at any level above 1. It’s ridiculous. I’ll have to call them tomorrow. If you recall I had an issue with some cacao treats when I first bought it; I thought I was doing something wrong but you and other people on other sites have been making coconut butter in a couple of minutes; mine just won’t do it. Bummer. I have found using a cookie scoop works fantastic for scooping out hard/ cold coconut butter or oil. You can buy the scoop by size too! I use a 1 Tablespoon size, there are larger and smaller ones available. They look like ice cream scoops, have made using coconut oil a lot easier! Hi there, it’s good finding this community! 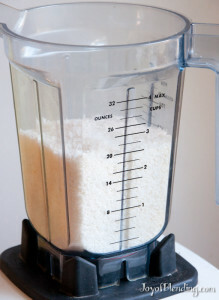 Does anyone know if you can use a Vitamix S30 High-Performance Blender for Coconut Butter? It has a 840 watts motor and is available in Australia for a good price now. I know it can make Nut Butters. Someone said she makes smoothies with ice in it. I have a Ninja Pro 900 watts that has no problems with almonds and chia seeds and fruits from my freezer, making them fine in a Smoothie. I also make a nice Honey and Lemon (warm morning health cuppa) in my Ninja Pro with Mint and Crinkly Parsley and it does those fine. If I add 1/2 tsp of Coconut Oil to this blend or Shredded Ginger (bought in Asian store) in this Smoothie, it makes it nice and Creamy, like a dairy blend. 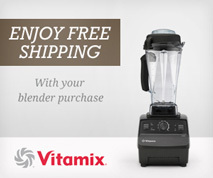 Do you think the Vitamix S30 High-Performance Blender 840 watts would give this kind of results? Alison from, Loving It Vegan website has a Coconut Butter recipe using 4 Cups of Dessicated Coconut to 1 Tblsp of Coconut Oil that works quite well and she keeps it for 2 weeks. Because when oxygen is whipped into combined ingredients, the shelf-life of those ingredients alters dramatically, would be the reason for that. With ingredients readily at hand, we could make a small amount fresh on a regular basis, hey? I have not made coconut butter with the S30, but based on my experience making almond butter with it, I think it should work fine.